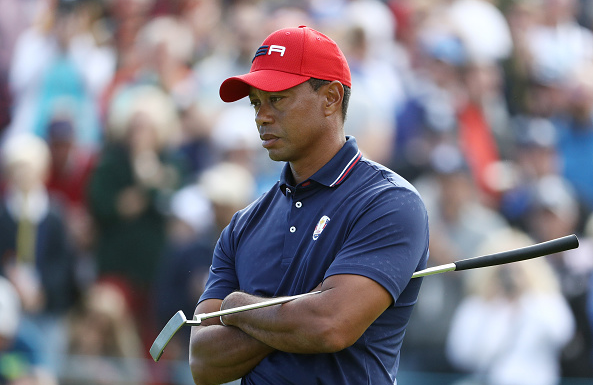 PARIS – Tiger Woods looked half asleep as he finished off another underwhelming Ryder Cup effort, losing for the fourth time in three days at Le Golf National – this time to 23-year old Jon Rahm, 2 & 1, in Sunday’s singles matches. After claiming his first victory in over five years last week in Atlanta, Woods appeared ready to lead the U.S. team to its first win on European soil in 25 years. Instead, the 42-year old icon looked drained and mentally detached for much of the week in Paris. “It’s frustrating because we came here, I thought we were all playing pretty well, and I just didn’t perform at the level that I had been playing,” said Woods. On Friday, Woods was paired with Ryder Cup legend Patrick Reed, yet the duo went on to record the only American loss in the morning four-ball session. Then on Saturday, Woods (joining Reed in the morning, and Bryson DeChambeau in the afternoon) lost twice to Italy’s Francesco Molinari, who teamed up with England’s Tommy Fleetwood, to set a Ryder Cup team record by going 4-0-0. On Sunday, it was much of the same, as an uninspired Woods looked disengaged and lost to the fiery Rahm, who birdied the first hole and never lost the lead.